I mean seriously, so many of us spend so much time trying to get life exactly right. As if today is tomorrow’s dress rehearsal. It’s not. It is our one guarantee for the day, actually not even the day, for the moment. Worry is such a waste of energy. And sometimes it has a partner, fear. Worry and fear come visit us for different reasons. They have been my companion of late. I haven’t physically felt at the top of my game and I invited worry and fear to the party. Together they have mixed for one unpleasant cocktail. But when I seriously think about it, what are they doing for me? When I stopped long enough from my potent drink to stop cowering and really answer the aforementioned question- life became a little clearer. They aren’t adding to my life; they are detracting from it. Worry and fear make you miserable. So much wasted energy combating an enemy that is in your mind. I don’t think this realization is going to cause me to feel better overnight, but it did cause me to exhale a sigh of relief, which brought a measure of peace. I can’t go back and change decisions, small or not, that I regret and I can’t spend the future on the what- ifs. I really can only rest in the now. The clicking of my computer keys, the warmth of my home, the rocking of my chair, the assurances of my Savior. Worry and fear cause your brain to get stuck like a cog in a wheel. It takes work to snap out of it and retrain your brain. Once you start convincing your brain the world is an unsafe place and someday you are going to die, it is more than happy to go into overdrive. This world is not perfect and I am far from perfect, but I do have a choice. A choice to live life and for it to be abundant. If you are struggling with worry or fear, spend some time watching someone who lives in physical pain daily, who has a terminal illness or debilitating disease. Watch them as they smile. Watch them as they wake up every day still choosing to live out their days, not awaiting some unexpected doom, but joyfully looking towards the future. They are not allowing their circumstances to define them. They are living in the very precious present. Life has its hard days. If you have been overwhelmed by fear and worry as I have, don’t make it worse by continuing to beat yourself up. You have a choice. It won’t change overnight necessarily, but it will make a difference. So, I haven’t felt well lately- this too shall pass. I have a choice. Drink the bitter, soul-permeating libation of fear and worry and allow it to rot my gut or choose to swallow the sweet nectar of faith, hope, joy and love. I choose the latter and I choose it now. 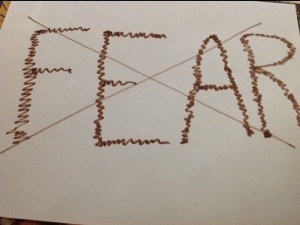 This entry was posted in Life and tagged brain, energy, Fear, worry. Bookmark the permalink. Glad to hear, don’t worry about things you have no control over just put it in Gods hands and then let it go.